Almost every minister will agree that there is a church within the church—that group of people, often a minority, in almost every congregation who have personally met the living Christ and can never be the same again. The word church comes from a Greek word, ecclesia. This is from a verb meaning “to call out.” The church is composed of all those true believers from Pentecost onward who are united together in Christ. The Bible teaches that we are the Body of Christ, of which He is the Head (Ephesians 1:22-23). As such, the true church is a holy temple for the habitation of God through the Holy Spirit (Ephesians 2:21-22). Therefore, within the vast complexities, bureaucracies, organizations and institutions of Christendom there exists the true Body of Christ. The members of this true Body are, for the most part, known only to God. They are the ones who have their names written in the Lamb’s Book of Life (Revelation 21:27). They are scattered in all denominations, and many are in no denomination at all. They are the “called-out” ones. It is this church within the church against which Christ promised the gates of hell would never prevail (Matthew 16:18). I was asked to write an article for a leading British magazine on the subject “What I Would Do to Change the Church.” I would like to list some changes that I suggested in that article. First, I would call the church back to biblical authority. The Protestant church today is possibly as far from the authority of the Scriptures as was the Roman church in the 16th century. We desperately need a new reformation within the Protestant church. Jeremiah the prophet charged the people of his generation, saying, “For you have perverted the words of the living God” (Jeremiah 23:36). In our generation the teachings of the Bible are being perverted by many churchmen. The authority of Scripture itself is being rejected. Thus the church is floundering like a ship at sea that has lost its rudder and compass. We are like a plane in heavy weather that has lost radio contact with the tower. Second, I would suggest that every member of the church begin where the disciples began—at genuine conversion. Jesus said, “By their fruits you will know them” (Matthew 7:20). The very fact that the fruit of the Spirit, such as love, joy and peace (Galatians 5:22), does not characterize average professing Christians indicates that they have never had a genuine experience with God. After preaching all over the world and observing the work of the church, I am convinced that there are great hordes of people loosely identified with the church for various reasons who have never experienced scriptural conversion. The distinguishing mark of Christ’s disciples was that people could tell that “they had been with Jesus” (Acts 4:13). Great sections of the church today have been rendered sterile and nonproductive because Christ’s spark of divine light is not resident within them. Third, I would teach the necessity of the infilling of the Holy Spirit. The disciples were nothing before Pentecost. They were everything after it. When we read about famous Christians down through the centuries, we cannot escape the tremendous emphasis of the Holy Spirit in their lives. The church today has all the tools for conquest—money, edifices, organizations, education and methods. But we lack the God-given spark to ignite these things into a spiritual fire that could sweep the world and help bring peace to our desperate world. That spark is the personal infilling of the Holy Spirit in the life of every believer, without which the church has no spiritual power. Fourth, I would call the church back to biblical discipline. I would not call for a return to Puritanism with its legalism and excesses. However, we do need a new Puritanism that will lead to self-discipline, self-denial and a willingness to take up the cross of Christ, while at the same time preserving the great freedom that we have in Jesus Christ. The church has drifted into a dangerous antinomianism—so serious that those outside the church can discern very little difference between the Christian and the non-Christian. The Scripture says that the Christian is to live a life separated from the evils of the world. Fifth, I would teach the centrality of Christ. “In Him we live and move and have our being” (Acts 17:28). One cannot read the New Testament without being impressed that the early Christians had Christ at the center of every act, word and deed. Today we have hidden Him with jargon, borrowed rituals and all kinds of religious trappings. These need to be stripped away so that people can see the genuine, living, redeeming Savior. Sixth, I would call the church back to the thrill, excitement, joy and expectancy of the early church. We have become dead in orthodoxy and dead in liberalism. On the day of Pentecost, the Christians were so excited that the people thought they were drunk (Acts 2:13, 15). We go into the average church today and certainly no one would accuse us of being drunk; rather, we are accused of being asleep. Wherever Jesus went, there was excitement in the community. 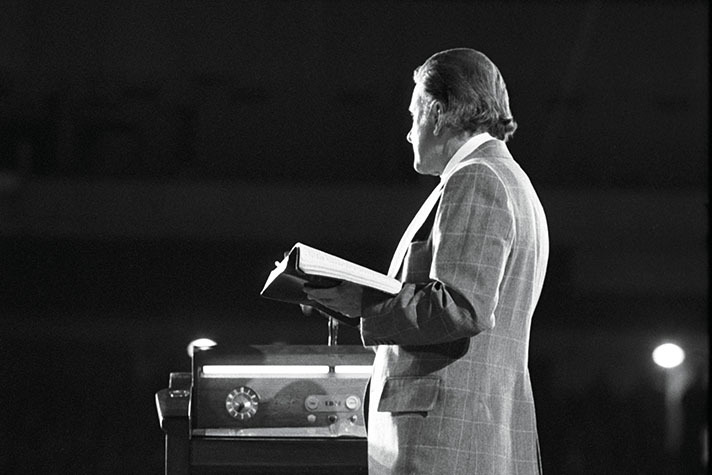 Wherever the apostles went, there was a sense of excitement and expectancy. And we need to recover it. Seventh, I would call the church to a new relevancy. I would call the church to a proper perspective in coming to grips with the staggering social evils of our time. I would start, however, from a spiritual point of view. Only a healthy church can help a sick world. Much social action today is nothing but sheer humanism. I am convinced that we cannot save the world until we ourselves are first saved. We cannot change the world until we as members of the church have been transformed by the power of Christ. We cannot redeem society until we ourselves have first been redeemed by Christ. 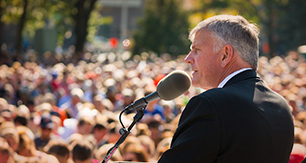 In 2016, Franklin Graham will be working to redeem society as he proclaims the Good News in all 50 states and challenges Christians to live out their faith. One of the leaders of a vast poverty program told me that his experience in years of social work has led him to the conviction that men and women’s greatest need is spiritual. This is precisely why Christ said, “You must be born again” (John 3:7). In the church, though, there are those who hold that evangelism should be reinterpreted along the lines of social engineering, political pressure and even violent revolution. We are told, “That’s the way to get things done.” We are witnessing today the greatest emphasis by ecclesiastical organizations on pronouncements, lobbying, picketing, demonstrating and even a call for violence to bring about social and political change in America. Certain church leaders feel that society must be compelled to submit to their ideas of social change. They say that this is the major part of the Christian mission. I believe that the changing of people’s hearts is the primary mission of the church. The only way to change men and women is to get them converted to Christ. Then they will have the capacity to live up to the Christian command to “love your neighbor as yourself” (Mark 12:31). We as Christians have two responsibilities: first, to proclaim the Gospel of Christ as the only answer to mankind’s deepest needs. Second, to apply as best we can the principles of Christ to the social conditions around us. The world may argue against a creed, but it cannot argue against changed lives. This is what the simple Gospel of Christ does when it is preached and proclaimed in the power and authority of the Holy Spirit. Are Nominal ‘Christians’ Walking Away From Faith?